Big Train and the Riverdogs battled it out in their game today, going through 10 full innings in Loudoun. 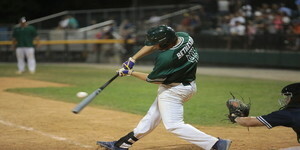 The Riverdogs came out with the win in the bottom of the tenth inning, winning 4-3 over Bethesda. With this game, Big Train’s record changes to 31 wins and 6 losses, and the Riverdogs record improves to 9 wins and 25 losses. Both teams remained scoreless until the fifth inning. In the top of the inning, Jacob Westerman (University of San Francisco) got to second base with a line drive out into center field. Westerman advanced to third base off a fly ball hit on a fly ball out into center field. Up at bat next, Andrew Shebloski (St. Mary’s College (CA)) made it to first base when he was hit by a pitch from the Riverdogs. With Fox Semones (James Madison Univeristy) batting next for Big Train, Shebloski was able to steal for second base. The Riverdogs catcher tried to catch Shebloski stealing and overthrew the ball, allowing Westerman to come home and score the first run of the game and bring Shebloski to third base. Shebloski was able to make it home for Bethesda off a sacrifice fly out from Tyler Villaroman (University of San Francisco), putting Big Train in a 2-0 lead. The Riverdogs answered back in the bottom of the fifth inning, scoring three runs to take the lead 3-2. Jordan Ebersole made it on first base for Loudoun with a groundball to second base and a Big Train error. With Collin Casey at bat, Ebersole was able to steal for second base, and Casey was later hit by a pitch, getting on first base. Ben Blackwell, batting next, hit a fly ball wide into right field, allowing Ebersole to come home to score and Casey to make it to third base. Casey and Blackwell were able to come home and score an additional 2 runs off a groundball hit from Alejandro Aponte towards second base. Big Train was able to tie the game at 3-3 in the top of the eighth inning. Tyler Villaroman made it on first base with a walk, and with Carson Taylor (Virginia Tech University) at bat, Villaroman was able to steal for second base. Villaroman came home to score Big Train’s third run of the game off a groundball from Taylor hit between first and second base and an error from the Riverdogs. Neither team scored again in the regular 9 innings, so the game extended into a 10th inning. In the bottom of the 10th, Matthew Thomas made it on first base with a walk, and he advanced to second base off a line drive hit from Brady Lloyd. With Jack Howard batting next for the Riverdogs, Thomas and Lloyd were able to advance to third and second base, respectively, off a wild pitch from Big Train. Howard ended up hitting a groundball over the head of the Big Train pitcher, allowing Thomas to come home and score for the Riverdogs, bringing the final score of the game to 4-3. Big Train has a two-day break, and they will be returning home to take on the D.C. Grays. First pitch is scheduled for 7 p.m.